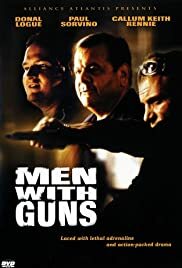 Courtesy of Supreme Records / PolyGram Holdings, Inc.
Men With Guns opens with two twenty-something guys sitting around discussing the times in their life when they were humiliated. Gregory Sporleder, Lucas, relates the time when he was forced to hold a guys coat every gym class or risk getting beaten up. Donal Logue, as Eddie, listens intensely, "I thought that was your coat... why didn't you tell me? Ah man, I got your back! You know that!" This powerful opening stands out more than anything else that happens in this film. It concerns two friends, Eddie and Lucas, who go out to a farm to retrieve some money for a local club owner. When they arrive, they are brutally attacked by a group of thugs. The incident doesn't sit well with Eddie and Lucas. They decide to put a scare into the men who attacked them. They manage to recruit one of their friends, Mamet, played by Callum Keith Rennie. Mamet is a well meaning sort but his mind-set appears suspended somewhere out above the clouds. The revenge plan goes horribly awry. Eddie and Lucas find themselves sitting in a room with three corpses and a whole lot of money and cocaine. At this point the film seems to get lost. It really doesn't know what to do or where to go. We watch as our three simpleton heroes party away the cocaine and money. A problem arises when it becomes evident that the cocaine and money actually belong to a local mob boss played by Paul Sorvino. Sorvino and his laughable cronies begin a man-hunt for the three. Without trying to give anything away, the film becomes a little tedious and manages to immerse itself in a bloodbath. A needless one. Where the film gets lost in its story it finds solace in its actors and characters. Callum Keith Rennie, a truly amazing Canadian actor, offers a haunting performance as a man whose subtle eccentricities begin to give light to his absolute insanity. Also watch for Easy Gary played by Max Perlich. His character is one of the most interesting that I've seen in a film in a long time.